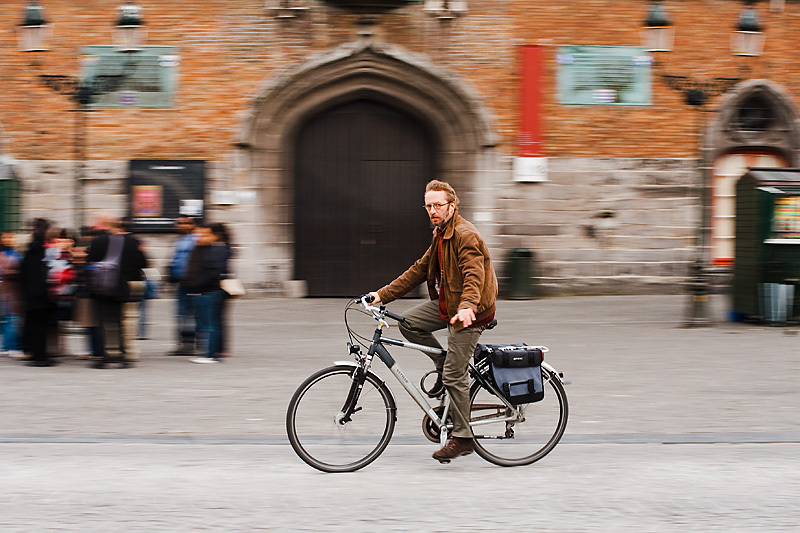 Panned photo of a bicyclist in front of Grote Markt's belfry. Overcast days are perfect for slow shutter speed work. For these types of photos, I initially dial in a 1/30 second shutter speed, lock in the approximate focusing distance then, after the first few test exposures, go from there (everything done manually). Panning with and subsequently capturing the moving subject crisply is much more difficult. In this case, I simply tried to keep one of my viewfinder focus points locked onto his head while panning. I attempted approximately 20 shots before I ended up with ones that I was pleased with. 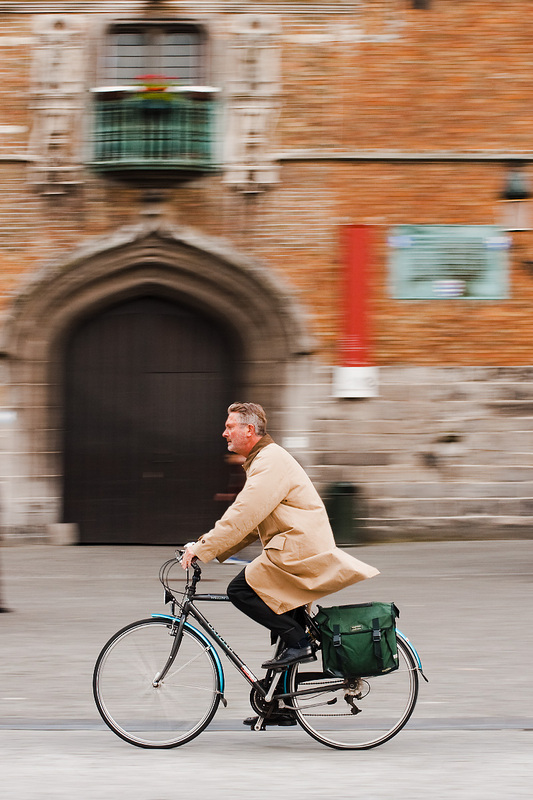 A bicyclist is shown against a motion-blurred background. Of all the photos I shot this evening, this one was absolutely tack sharp. On a non-technical note, Belgian people appear to be a hearty bunch. The winds were howling around this time as the temperatures reached approximately 47°F (8°C). Yet most cyclists had neither gloves or full Eskimo seal leather jackets lined with polar bear fur. As for cowards like your trusty cameraman, I was alternating 15 minutes of shooting with 30 minute cappuccino breaks inside the warm lair provided by French fast food chain, Quick. Btw, awesome picks token from my city... keep up the good work! !